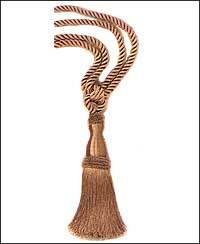 Tieback 8 1/2" Tassel 31" Spread - 12 solid colors ON SALE!! acetate and cotton single tassel tieback with an 8 1/2" tassel and a 31" spread from our Princess 1 Collection. This item has been discontinued. NOW ON SALE FOR 10.00 EACH! !